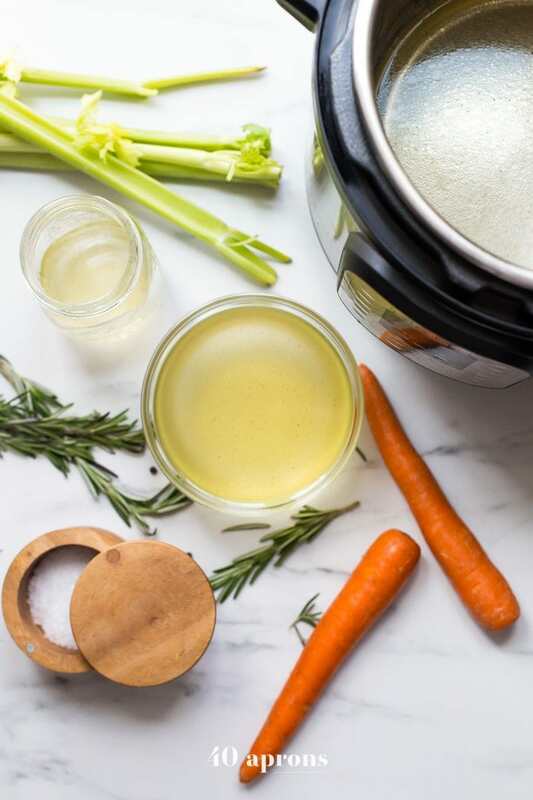 This Instant Pot bone broth is super nourishing and so easy to make. It’s deliciously rich and nourishing, plus it gels like a straight up Jell-O jiggler! 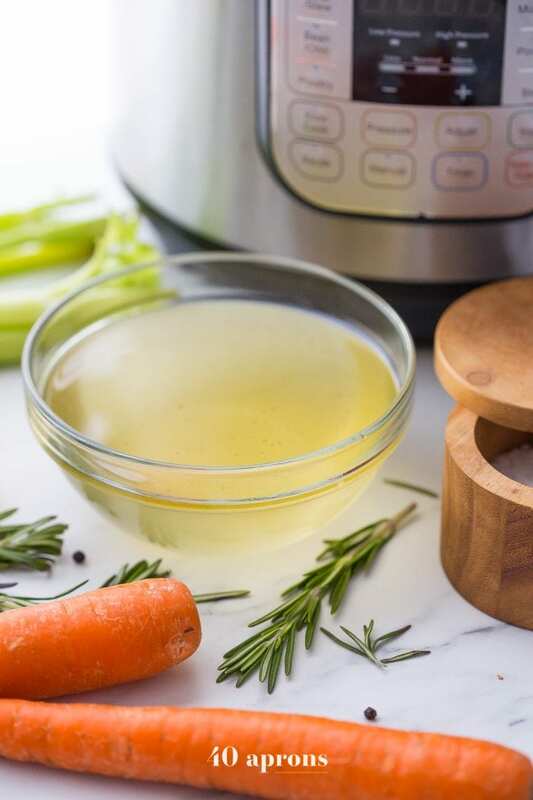 This Instant Pot bone broth is made with both chicken and beef bones, is super versatile, and boasts amazing health benefits, too. I’m so glad bone broth is a thing now. I remember reading The Bell Jar back in high school, it resonating deeply with my manic pixie dream girl teenage angst and ennui, wondering if I’d ever climb into a crawlspace and wake up in a ward for wayward ladies. It’s this scene I remember best: the floral wallpaper and the strangely mellow cadence of the ward, the way they served warm chicken broth in mugs with a pat of butter floating on top, melting slowly into the liquid. A strange scene to stick with me, I suppose, but it was one that made me realize a tiny nuance of mine wasn’t a nuance at all. At 14 years old, this was a revelation. 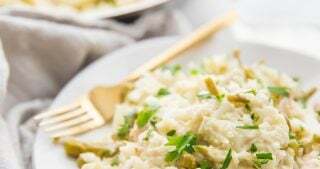 I’d been known to opt for chicken broth over tea every time, drinking the rest of the can from the pop top like soda when we made rice pilaf or chicken and gravy. I’m so weird. Like, who does this? I’m sooooo weeeiiiiiiiirrrrrrdddd. The line in Plath’s book made me realize it was not strange at all, but, rather, a previously ubiquitous remedy for what ails you, a food communally understood to be the most nourishing there is. Looking back, it’s obvious! Chicken soup is still our go-to when feeling under the weather, right? Did I ever think the noodles were the healers there? So when bone broth became a “thing,” and we were suddenly encouraged to regularly drink warm mugs of the rich stock daily, I was overjoyed. Savory and salted, loaded with gut-healing properties, and just so comforting, sipping bone broth is my favorite self-care practice. Bone broth = stock. Stock is made from bony bits of whatever animal you’re after, whereas broth is made from meatier parts. Stock is richer, because of the gelatin released during the cooking process. 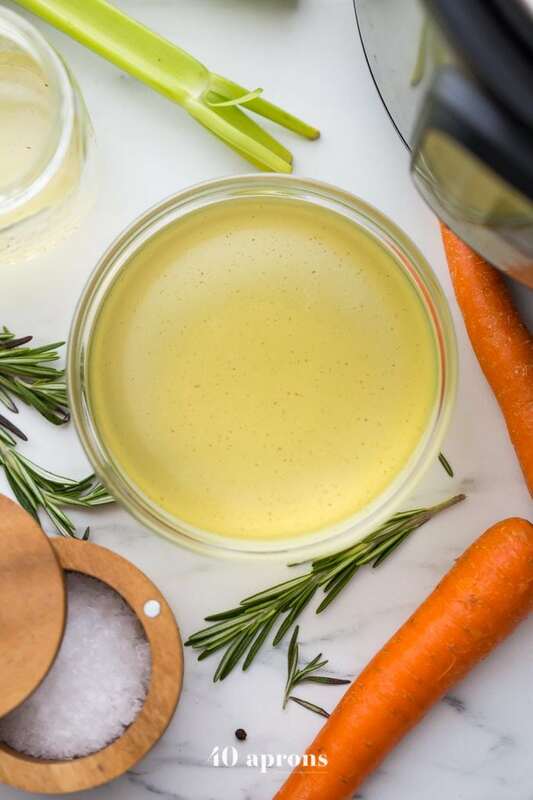 What differentiates bone broth from plain ol’ “stock” is the amount of cooking time: bone “broth” (We should really call it bone stock) is cooked for a longer amount of time, allowing more of the health benefits of the bones to seep into your stock. We then consume that stock with all its benefits and tada! All the health benefits are delivered easily. Bone broth contains healing compounds. The method by which you make bone broth allows you to break down and release important parts of the animal we simply don’t get from eating muscle meat – especially boneless, skinless cutlets (A personal pet peeve!). By simmering (or pressing a button on an Instant Pot bone broth and forgetting about it for 3 hours….. for example) these bones for hours, you release collagen, glutamine, proline, and glycine. These compounds are healing and powerful for so many of our body’s functions. Bone broth contains easily absorbed minerals. Bone broth contains calcium, magnesium, phosphorus, silicon, sulphur, chondroitin sulfate, glucosamine, and trace minerals. Not only that, but in bone broth these minerals are present in forms that are easily absorbed by your body. Bone broth is high in protein. We all know how important protein is for us, and bone broth is a fantastic way to get more of it. 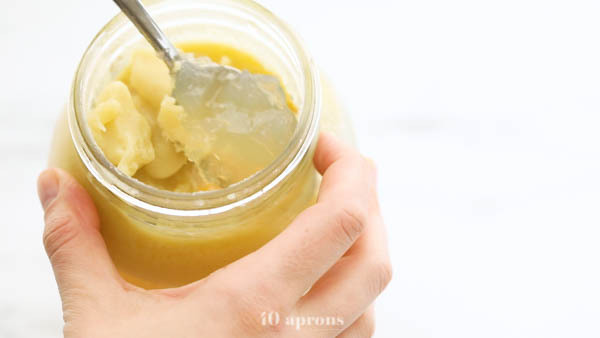 There are 10 grams of protein in 1 cup of commercially prepared bone broth, and I would venture to guess my recipe has even more, thanks to the number of bones I use (so many that this Instant Pot bone broth gels – a true sign of an amazing gelatin content!). Bone broth is high in collagen. Collagen is so necessary for our bodies to function optimally, and it’s especially important for skin, hair, and nail growth. However, I’ll be honest with you: my skin, hair, and nails have always been pretty good to go. I’ve been surprised at my improved digestion, rather, since I started regularly drinking collagen, either in bone broth or as a supplement. Beyond that, though, collagen literally keeps your body together, and it breaks down as we age. Unfortunately, thanks to our culinary culture that focuses almost entirely on muscle meats, we don’t get much of it in our daily diets. Collagen is my #1 most recommended supplement of all, and bone broth is a fantastic way to get it. Bone broth is high in gelatin. 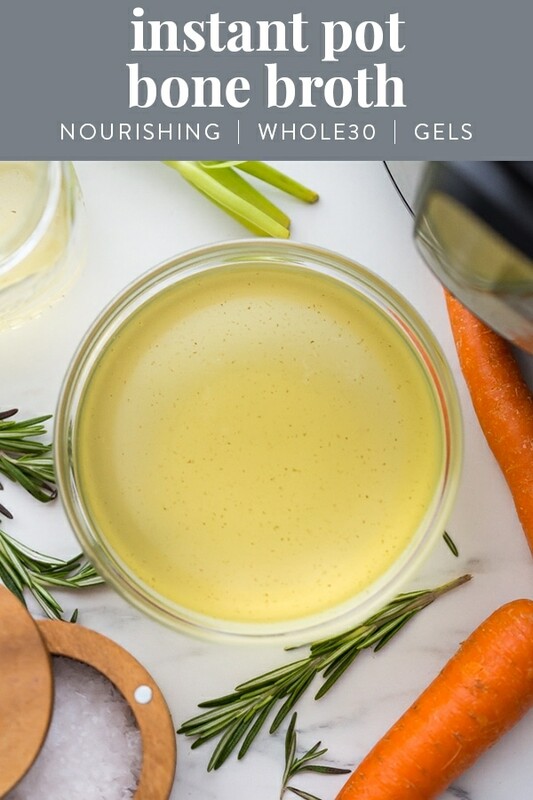 According to Dr. Axe, “gelatin improves gut health and digestion, protects joints and lowers joint pain, helps improve sleep quality, lifts mood and improves cognitive abilities, improves skin health, helps maintain heart health, maintains strong bones, and helps you feel full.” Oh OK.
Now that you’re convinced, let’s talk about this Instant Pot bone broth recipe. It’s Whole30-compliant, so freaking easy, ridiculously rich, and it gels like a packet of Jell-O, y’all. We have giant jars of this Instant Pot bone broth in our fridge at all times. It’s so easy to make so we keep it on hand, and I drink it daily. I scoop out a cup of the jiggly gelatin, warm it up on the stove, and sip it on the couch, while we watch / try to figure out what in the hell is going on in Dark (Have you watched this show? As if a time-travel/wormhole could get any more confusing, it’s in German.). I know just how good it is for me, and so it makes a lovely, nourishing self-care ritual that I engage in I’d say 6 times a week. I hope you try it! 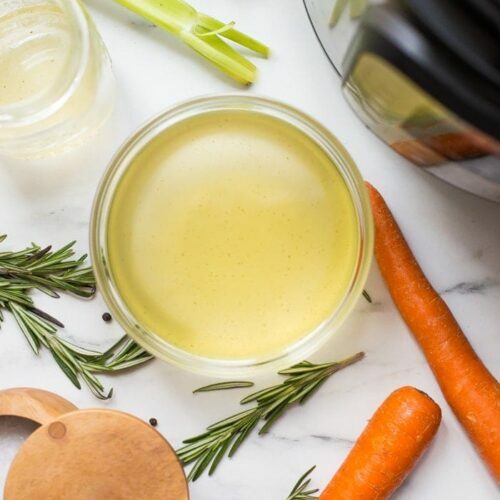 This Instant Pot bone broth recipe is also perfect for a Whole30; it helps heal your gut and doubles down on the nutrients you’re funneling to your body. 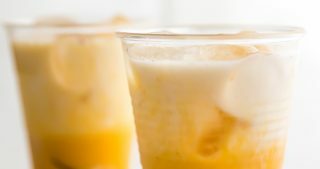 It’s an easy way to replace that after-dinner drink, and it’ll make you feel so, so much better in the morning, I promise. Roast some marrow bones at 350º for 20 minutes. Throw them in the Instant Pot with some gelatinous bones (like feet… oh yeah, we’re going there), a few aromatics, pour water 2/3 of the way up the Instant Pot. Seal it up, and let it cook on Manual Low Pressure for 3 hours. That’s it! Strain and pour into an airtight container. Look at that gorgeous gel! No more hovering over the stove, scooping away foam, forgetting you left the burner on as soon as you’re 10 minutes away (Like, for example). 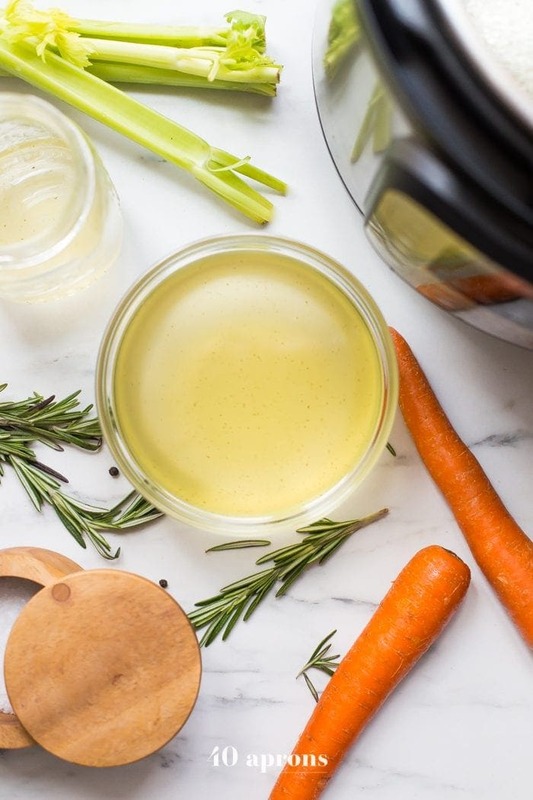 Nope, this Instant Pot bone broth recipe is crazy easy. What kind of bones do you use for bone broth? You can mess around with bones you use here, but I highly recommend using marrow bones and gelatinous bones, so you get plenty of gelatin and collagen in there. I prefer these over regular chicken bones, actually; I made a batch with a chicken carcass and some marrow bones last night, and it simply didn’t gel like my other batches do. I stock up on these bones when I go to the international market; they always have a fantastic selection. I highly recommend you use Himalayan pink salt or Celtic sea salt to season your broth. Both of these salts contain the trace minerals your body needs, and they’re perfectly reflective of the minerals in our bodies. They’re truly healthy food! It’s a great way to add in these superfoods to your diet and make it taste even better. 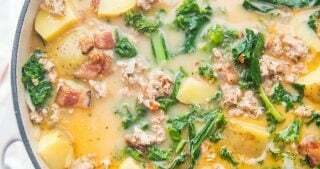 You can find this recipe in my digital cookbook, The Paleo Instant Pot, which has over 30 super flavorful and Whole30-compliant recipes made in the Instant Pot. 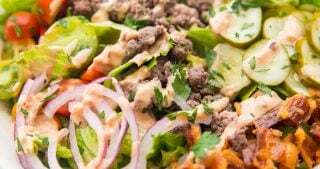 Perfect for a Whole30! Instant Pot bone broth: high or low pressure? I like to cook my Instant Pot bone broth on low pressure, to give the pressure cooker time to eke all the goodness out of the bones. However, you can absolutely cook yours on High Pressure – 120 minutes is perfect! How long can you keep this Instant Pot bone broth in the refrigerator? This bone broth gels and has a lovely layer of healthy fat on top, essentially sealing it from air and ickiness. If you keep this layer of fat intact, the bone broth will last weeks, if not months in the fridge. However, once you break the seal, so to speak, you’ll want to consume the Instant Pot bone broth within about 4-5 days. It does, though, keep beautifully in the freezer. 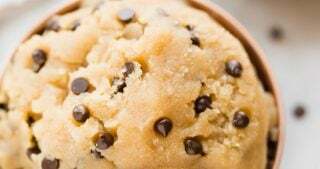 I like to pour mine into a large freezer bag and freeze it flat on a baking sheet then transfer to our deep freeze. Bone broth will keep about a year that way! To make this Instant Pot bone broth, I recommend this Instant Pot (<<< affiliate link!). 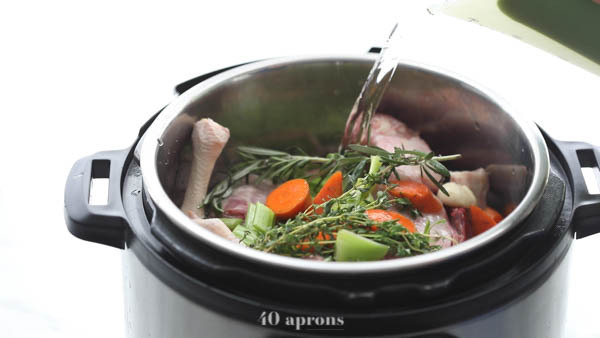 A super nourishing bone broth made in the Instant Pot with chicken and beef bones. Rich, quick, and easy, it gels like a Jell-O jiggler! 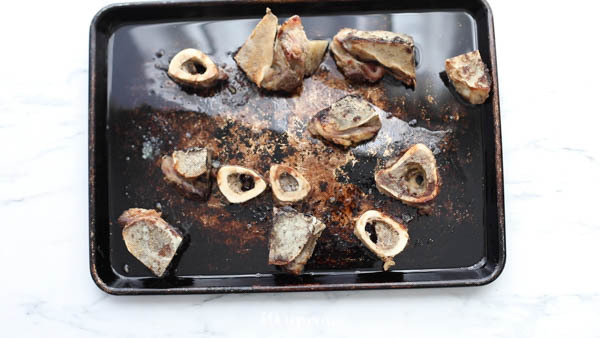 Preheat oven to 350º F. Spread marrow bones out on a cooking sheet and roast 20 minutes. Carefully turn the bones over and roast another 15 minutes. Remove from oven and let cool slightly. Transfer roasted bones to Instant Pot, then pour a little water on the cooking sheet. 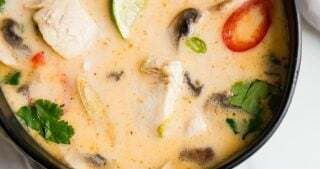 Use a spatula or whisk to loosen the browned bits left over from the bones, then pour the water, melted tallow (fat from bones), and browned bits into the Instant Pot. If using apple cider vinegar, add other bones to pot and pour vinegar over. Let sit 30 minutes then proceed with recipe. Place other bones (necks, feet, or backs), carrot, celery, a few peppercorns, fresh herbs, and plenty of sea salt in the bowl of the Instant Pot. Pour filtered water up 2/3 full, then secure lid with valve in Sealing position. Cook on Manual Low Pressure or 180 minutes, then natural release. Let cool to touch. 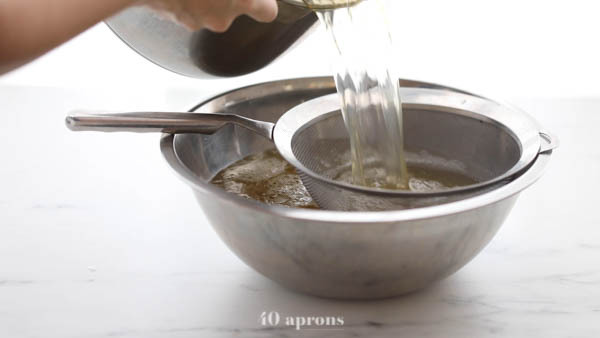 Place a mesh strainer over a large bowl and gently pour broth over strainer. 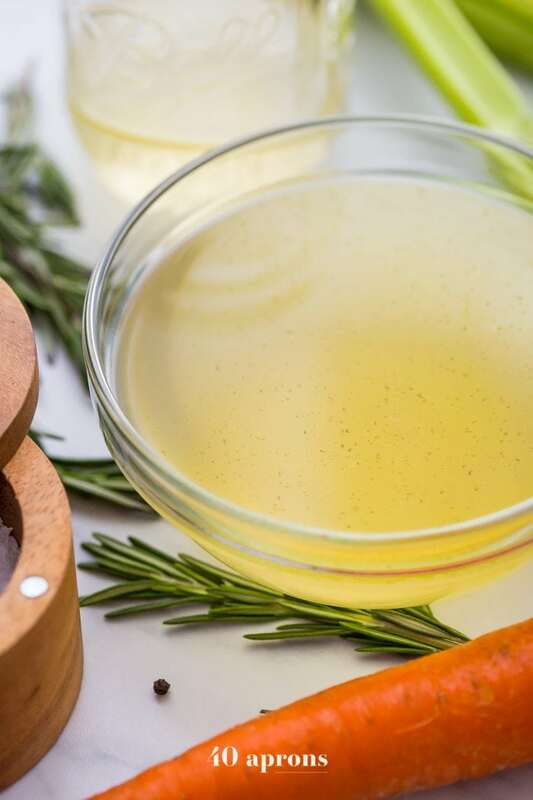 When all broth is strained, discard bones and veggies, and pour broth into glass jars with tight-fitting lids or into plastic freezer bags. Keeps in the fridge for about a week. Alternately, freeze, lying flat. Keeps in freezer for several months. I usually refrigerate what I’ll drink or use that week and freeze the rest. Letting the bones with with apple cider vinegar helps extract all the nutrients from the bones. 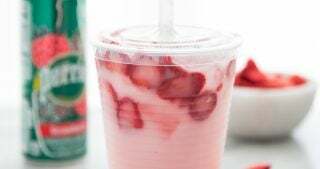 I prefer the taste without, however, and since I drink it daily and make a batch every other week, I simply go without. But try it with the ACV and see if you like it! It is seriously a life-saver! You should definitely get one. You will not regret it. Promise! Absolutely delicious! Used 3 beef prime rib bones frozen from Christmas and a chicken carcass. Used 1/2 lemon in place of ACV. Can’t believe how easy it was to make and it gelled. Yay!! Hi Cheryl! 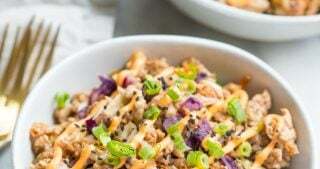 I made this recipe but I had knuckle and marrow beef bones and it didn’t get 🙁 I know you said you find your beef and chicken feet at the international market, but I really want to buy pasture-raised animal products if possible. Do you have any recommendations on where I can find pasture-raised beef and chicken feet? Thanks for the rad recipe, it was taking me a day and a half to make this before! I have tried beef bone broth (homemade), but it tends to break my skin out (I know, odd). I have been using one rotisserie chicken carcass (but not roasting bones in oven) with 2 tbsp apple cider vinegar (but not presoaking them in the vinegar and water), salt and pepper, 4-5 chicken feet, water up to 2/3 level and cooking in the Instant Pot for 2.5 hours on high pressure. Afterward I can literally mash the bones with a fork or put the cooked bones in a blender and liquefy completely. The softened bones clearly contain marrow. The result is a bit milky. And the result is not gelling. Is the high pressure and possible boiling inside the Instant Pot destroying the gelling properties? Any suggestions? Hi! I’m excited to try this today! When you say “lots of sea salt”. I need a reference. I have a heavy salt hand and don’t want to ruin this. I’m also really excited about this blog and fb support group in general. Oh Em Geee those sweet potato fries look ahmazing. Thanks! My instapot does not have a have to adjust the temp. It’s either HIGH pressure cooking temp, or low slow cooker temp. Should I reduce the time? I did use this recipe and cooked it for the full length of time and it turned out nice. I’m just wondering if I need to cook it for so long. One other thing, I know the ads help pay for your site, and yes you do deserve to get paid for your experience and work. But there are so many it takes forever to navigate one page. Just an observation – frustrating one at that. 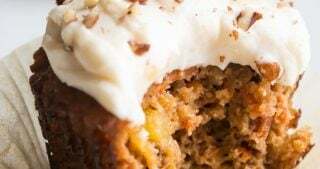 Lisa, if you have an issue with the display advertisements on my site, there is a “Jump to Recipe” button at the top of every single post, before any ads. All of our ads comply with Google’s standards and you’re right – this is how we pay the bills 🙂 We make it as easy as we can for readers to skip over the body of a post if they need, though. I would perhaps reduce the cooking time by about 30 minutes if your Instant Pot does not have a low pressure setting. However, if you cooked it as written and liked the outcome, I would not stray from what you did. Thanks! Thanks for the tip Cheryl, hadn’t noticed that option and it is very helpful. Love your recipe also. I’m curious about the reason for roasting the bones first–what are the benefits of doing this? What changes if I skip that step? Thanks. Roasting the bones adds so so much to the flavor. It also helps pull out the marrow and collagen. I wouldn’t skip it! If you don’t have an instant pot could you use a regular pressure cooker or a crockpot? 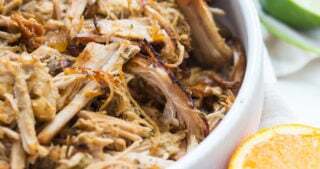 I can’t give any recommendation when it comes to a regular pressure cooker, but you could definitely make this in the Crockpot. After you let the apple cider vinegar sit for a little while, proceed with the recipe, cooking on Low for 18 hours. That’ll do it! When you are talking about other bones (neck, feet, backs) are those chicken bones? You can use whatever you like! I often use beef feet, and that combo makes it wonderfully rich. Or I’ll use chicken feet or necks. Really whatever I have on hand. As long as you have enough bones in general, you’ll be good to go! I’ve been making this broth in the IP for 120 mins on high pressure. Is it better for 180min on low pressure? I honestly don’t think it really matters either way. I likely use a lower and slower method because of how I’ve always made stocks but high pressure at 120 is definitely enough time to get what you need out of those bones. Just make sure you only fill the pot 2/3 of the way full for sure!